We’re fortunate here in California to not receive the dangerously cold temperatures that other parts of country are dealing with, however we still need to be aware of dropping temperatures and what that can do to the comfort of our homes – not to mention our heating bills. 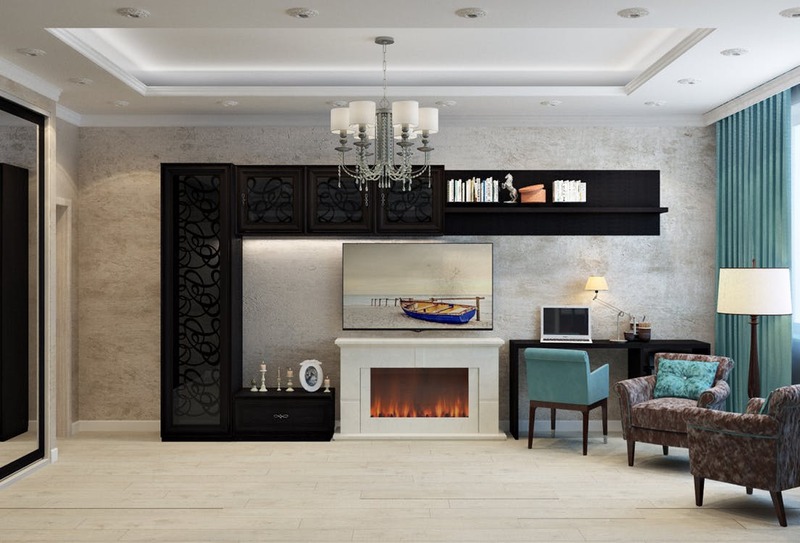 Learn how to keep your heat indoors and in the rooms that matter most. We’ve got a combination of DIY, professional services, low- and high-tech options for keeping your home warm. We’ll skip over some of the issues we’re fortunate not to have to deal with here, like removing snow from your roof or building snow barriers (whew! ), but read on for ways to make sure your home’s warmth isn’t money literally going out your windows.. and doors… and, well, you’ll see. Wood floors are beautiful, but the National Energy Foundation says as much as 10% of heat loss can be through non-insulated flooring. If you have an older home with the original floors, either hire someone to fix any insulation issues or invest in some great rugs (they look wonderful as well). If you have carpeting, the carpet and carpet pads themselves act as insulation. If floors still feel chilly, you can look at upgrading your carpet, but there’s a lot of other tips here that could lead to addressing the reason those floors are cold. The insulation between floors of your home may need some work. Unfortunately this isn’t the easiest job and would require a professional’s help. Rooms above garages and crawlspaces are often susceptible to having freezing floors, since the space under it isn’t warmed like other areas of the home. Fortunately this can be resolved with good insulation on the garage’s ceiling and the floor of the room above. Closing your chimney’s flue is the only step many of us are familiar with, but it’s actually not enough. Chimney balloons are inexpensive and go right up inside your chimney so they’re not visible once placed. They essentially act as a plug and prevent warm air from going right up and out your roof. Another option is woolen chimney insulators. Obviously, with both of these options, they would need to be completely removed prior to using your fireplace. 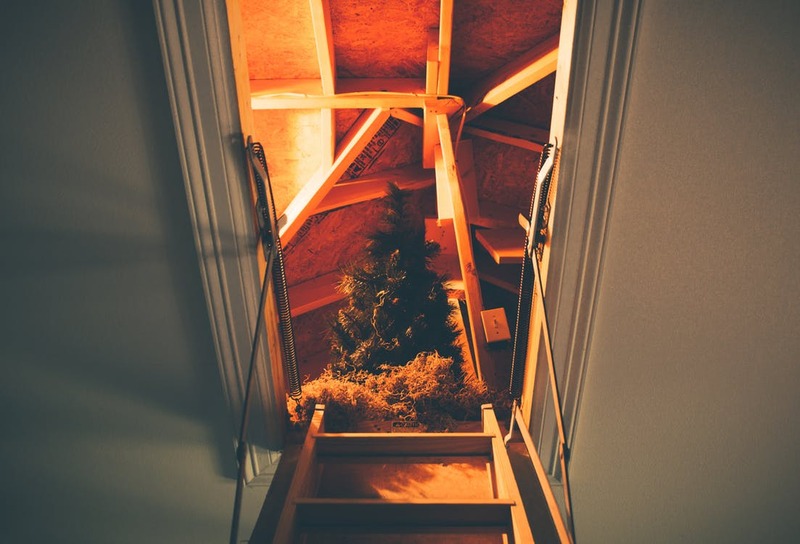 Heat goes up, as we all know, and in many homes, that means your attic can be a huge culprit of stolen warmth in the colder months. Your furnace could be too large. That sounds weird, we know, but hear us out. To really, adequately put the right sized furnace in a home, an HVAC contractor would need to do what’s called a “proper load calculation.” Many don’t, and just use a large one. What this does is blow a lot of hot air that may make your thermostat happy with the temperature, but if it’s done too quickly, your furnace didn’t get a chance to distribute the air all over your house, so you’ll have really warm spots and some freezing spots. This, unfortunately, is something you’d need to hire a professional to resolve. Your attic’s insulation isn’t the only concern with heat loss. While obviously a poorly-insulated attic won’t do you any favors, there are other factors to consider. There are areas in your ceiling where there are holes for vents, wiring, and even your attic hatch. These spots often get overlooked but can be just as important as the entirety of the attic itself. The materials in which your home was built even can play a factor. Aside from having a professional come out and insulate everything well (this means no gaps between cut squares of insulation batting, for one), you can also use spray foam insulator products in obvious areas that leak, and add good insulation to your attic’s hatch if you notice a lot of your warm air going up and out that way. Extra Tip: Don’t close your attic’s vents, though, despite what you may have heard. It doesn’t help and can cause a lot of problems for you. Windows are a big deal when it comes to maintaining your home’s temperature. In fact, they can leak 30% or more of your heat. That’s literally money going right out the window! If your windows are older, the seal around them may no longer be tight. Between deterioration and shifts over time, windows are a big source of heat loss in homes. You can add sealants or weather stripping around window frames yourself if the gaps aren’t large, or if you have the option, hire a professional to reseat and properly seal them. Single-pane windows aren’t as common anymore, but they still exist. While replacing windows isn’t in everyone’s budget, it’s something to consider if you notice drafts coming in through your windows. A DIY-option you can do cheaply with a hair dryer is to buy a window insulator kit. It’s essentially film that goes over your window to act like another layer and keep cold out. For long term solutions, especially if you’ve already checked off the above and have good quality, well-sealed windows is to really think about the window coverings. Cellular blinds give all the benefits of blinds without the slats that let in light and cold. They look great, last longer than plastic blinds, and they act like insulation over your windows or even your glass doors. One major plus is they can still allow sunlight to shine through, even when closed. Draperies and curtains are an easy, attractive solution. Draperies are thicker than curtains, and having layered window coverings allows you to pull shut the thicker fabrics when temperatures start dropping. Thermal curtains are similar to black-out curtains, except rather than darkness for better sleep, their extra layers of fabric are designed to keep the cold out and the warmth in. If the seal around your doors isn’t high quality and well-fitted, your heat could be going right out, or under, your doors. We don’t just mean exterior doors either! Replace the seals around the doors or add bottom-of-the-door insulators, often called “draught excluders” or many of us know them as “Draft Snakes”. We’ve seen some amazing DIY-versions that utilize old tights or socks filled with rice or even lentils! Foam strips are available as well that work wonders around the interior of the frame. If you have glass doors in your home, they require double duty. A lot of the above window tips also apply to doors. 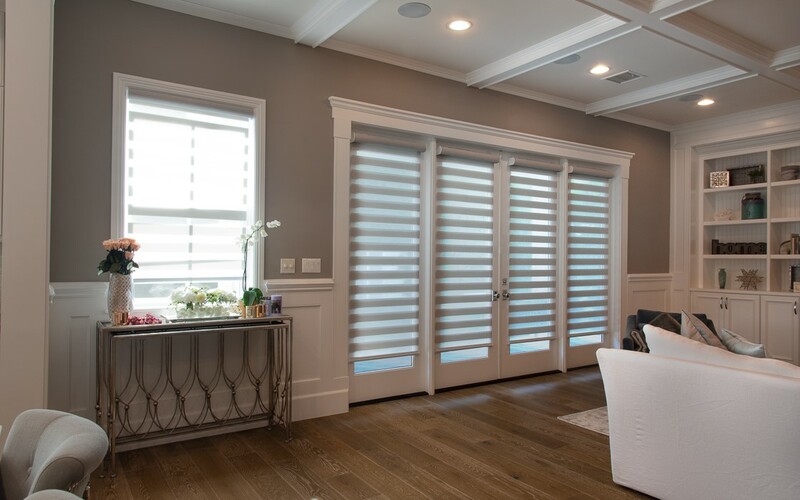 Thermal shades and draperies help with air management on these doors and look beautiful at the same time. If a room in your home isn’t used frequently and especially if it often runs chilly, close the door. Keep the heat in the areas you want it most. If you have rooms that aren’t used often at all, consider closing or blocking air vents so your heat is directed into your living areas instead of empty space. (If it gets cold enough to freeze, ensure nowhere with pipes is closed off, though.) Closing the doors of the room you’re in also helps keep the warm air with you. 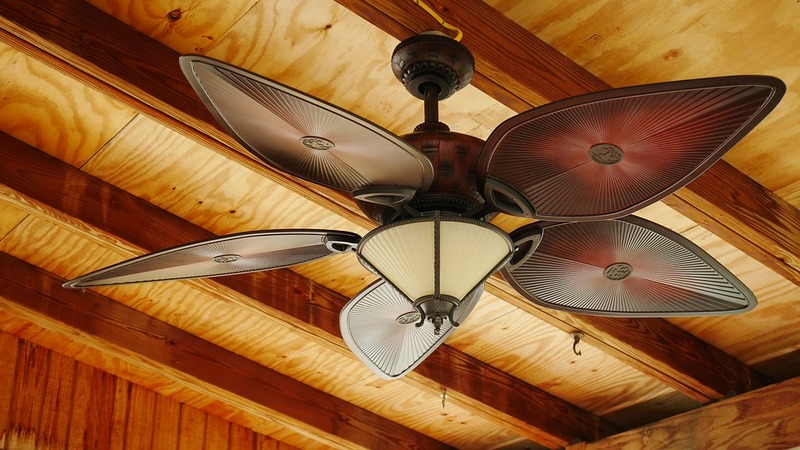 Ceiling fans aren’t just for cooling off! Fans in the summer pull air up, but in the winter the blades often have a way to switch their direction so they push air downwards. Since heat rises, this keeps the warm air you’re paying for in circulation down where you’re sitting instead of up against your ceiling.If you have a multi-story home and notice the downstairs is always chilly, not only is the ceiling insulation probably something worth looking into, but you can also place a fan at the top of stairs to blow warm air back down into the area that needs it. This can raise the temperature by 4 degrees in less than an hour, easily, depending on the difference. Who doesn’t love a hot bath or shower in the winter? That steam works double-time after your relaxation time is done! Rather than turning on the vent, open the door to your bathroom. Not only does the heat then disperse around your house, but winter months and heating dries out the air, and this works like one big humidifier so your sinuses will thank you as well. Extra Tip: Outside your home, check where your dryer and bathrooms ventilate to the outside. Ensure they have baffles/”vent blockers” so cold air isn’t coming into your home through the vents. Take advantage of your existing heat sources. Snuggle up with furry and human loved ones and share the warmth. Add some warm blankets and hot cocoa and relax. This may not save you money, but hey, it’s good for you. 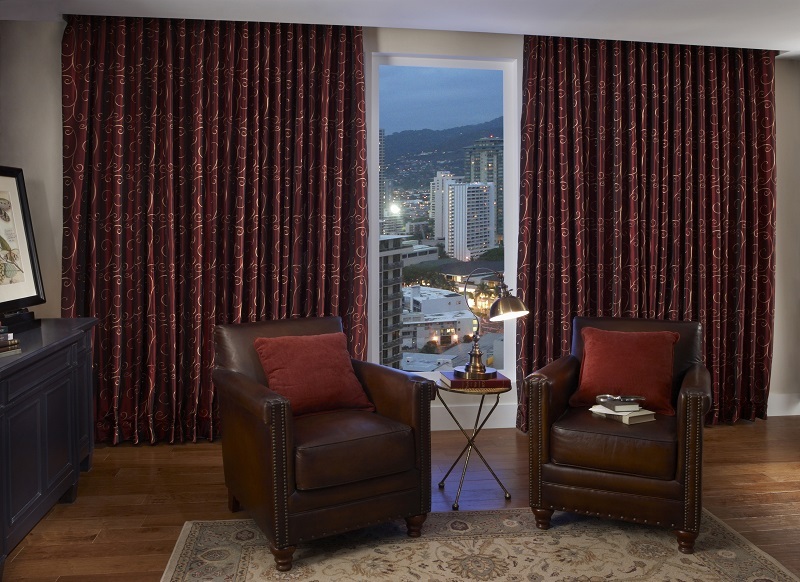 Want to schedule an appointment with one of our designers to add thermal shades, curtains or draperies to your windows?